The entrance to the Shore, like all of the plushest resorts, is like a dream. There were cold towels, drinks and a dance by the staff. Glee is the word. The water on the shore is tossing with a glee of its own. The same forces that brought us the rainy season are bringing us waves today. The hotel manager says that the water laps more casually in the quiet times, but the sound is welcome. 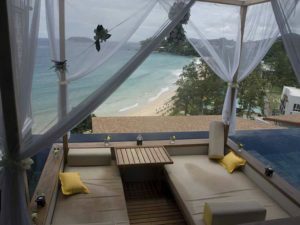 The villa has its own plunge pool, virtually at the end of the bed. There is a pink heart on the ribbon that ties the door and the towels are tied in the shape of two swans to make another heart. The villas are new, the resort well established. Along the sea shore there is a range of themed restaurants offering the cuisine of master chef Thavee Chantasit, seafood and meat in its Thai costumes and accompanying spices. If you have time for only one dish, try the royal starter aroy. 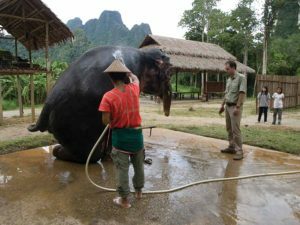 It is a three hour drive to Elephant Hills in Khaosok National Park and visit Jonathan from Kent, and his elephant nature experience. Elephant Hills offer accommodation in 30 African style safari tents, effectively catering for 60 people. The monsoon climate means the tents have a covering to keep the heaviest downpours at bay, and the resort also offers 11 floating raft houses at their “mangrove experience” and beach junk experience at Cheowlam, a nearby 739 square kilometre artificial lake, sleeping 18. Prices are about Eu300 (12,350 baht) for a two day and Eu600 (20,000 baht) for a four night experience, and the idea is to bring visitors up close and personal, not just with the elephants but with all aspects of nature, canoeing along the river through Khaosok national park, jungle trekking, lake explorations on the lake known as the Guelin of Thailand, accommodation. High season is November to April, and the visit is effectively a house call to the centre’s 11 elephants and their handlers from Maehonson province. Time was when an elephant trek was as far into the nature of Thailand as anyone could venture. At the moment you can trek with Jonathan’s elephant through the rain forest but Jonathan says he intends doing away with the elephant trekking next year. The rain forest that survives here in patches is the oldest in the world at 160m years, six times the age of the Amazon rain forest. And five times the size of the Great barrier Reef at its peak. Nature has been in retreat here for the past fifty years and adventurous experiences like Elephant Hill shop to turn the tide a little. You can sometimes hear tiger mating calls from the lake houses, Jonathan says, They are rare and elusive, but despite the fifty years flailing of the Thai rain forest, during which time logging reduced its footprint from 80pc coverage of Thailand’s to 15pc today, they are still there, a dozen of them defying mankind’s destructive ways. The elephants were used to chop down and destroy their own homeland and are now an endangered species. They are eating machines, consuming 250kg of food and 200 litres of water a day. Thailand once had 100,000 elephants and now it is down to 3,000, less than a thousand of them wild and just 50 of them in the wild in Khaosok National park. Their handlers come from a northern hill tribe. Karen is their language and they have a long history of taming and dealing with elephants. After that, tourists would be easy. After the adventure, the walking and the canoeing, came the traditional Thai massage. It involved sharp elbows and hard work into the muscles, the retrieval of sore spots and old sporting injuries. It was all done in the open on a sunbed by the beach, with the waves still murmuring. At night the hotel has asked us to light a Buddhist prayer lantern and release it. One by one we fill our lanterns with hot air and send them skyward in the dark. They form a procession of impostor stars as they climb, resembling the Starry Plough at one stage and Orion’s Belt at another. Some of our group prayed for health for themselves or a loved one, others prayed for good fortune, others for romance. In a sense we already had all three in one place, the Shore in Katathani takes hold of the senses like one of those lanterns and transports them through the sky. It will take some time to come back to earth.